If you have been following my posts closely, you may have noticed a few things about which I referred to trips for unexplained reasons, or about repairs to unspecified vehicles, or otherwise was being cagy about something. Well, enough has now happened that I can actually reveal what Lisa and I have been working on for the past month or so, and roll it out. Photos behind the cut. 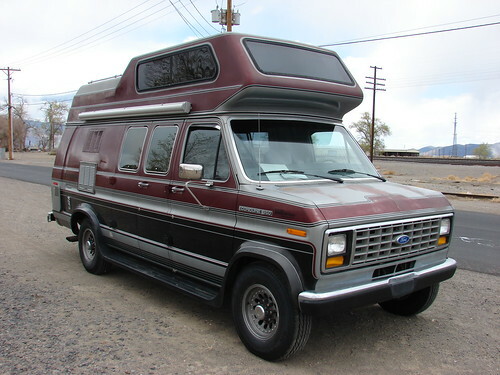 This is the vehicle that Lisa has named the Rolling Stone, a 1989 Ford E350 full-size van chassis with a Chinook Class B RV conversion. 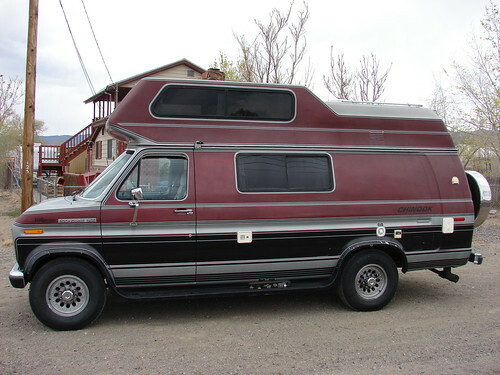 As RVs go, this is a relatively small one, but the intended use doesn't require a big rig. This is what it looks like when you open the mid-side split door. 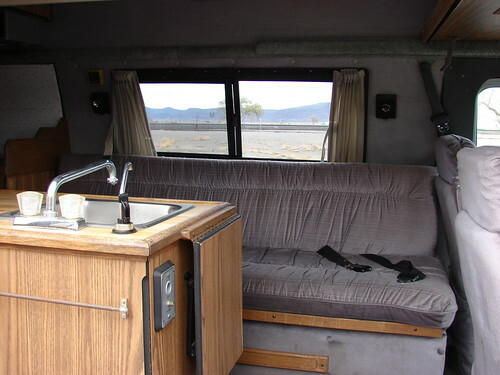 You see here the sink on the left and the sofa (with seat belts for the passengers in the rear) ahead. The forward portion of the vehicle is high enough for me to stand up fully. Here is the view standing between the two forward seats looking toward the rear of the van. The sofa folds down into a bed. 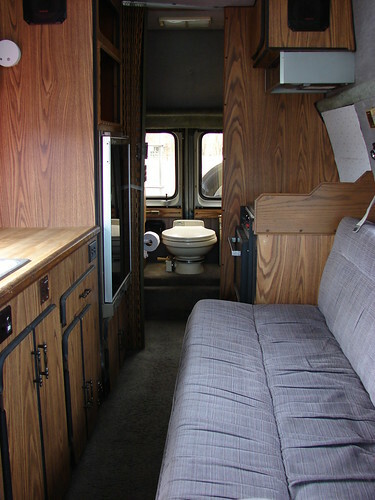 There is a toilet and shower in the rear compartment. In the middle is a refrigerator (propane or 110V ground power, no 12V DC setting, unfortunately) and a 4-burner propane stove with an oven. The clearances are tight enough that the only way you can open the refrigerator fully is to first open the oven door to make room for the 'fridge door to swing wide. Headroom is much more restricted aft of the kitchen. 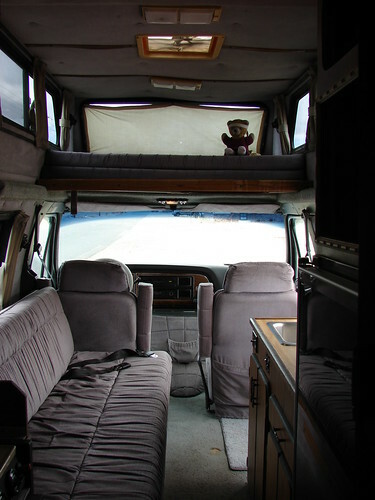 This is the view forward toward the "loft" over the driving compartment, where travelswithkuma is perched checking out the bed up there. You can pull a platform out here to make a bigger bed if necessary. 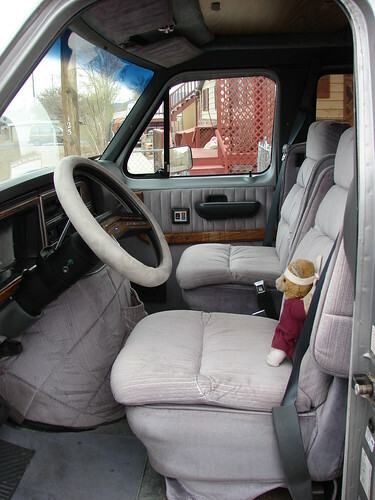 Kuma Bear is not allowed to drive the van, but he does sit in the seat here to show how much space there is. The forward captain's-style seats both can swivel 180° to make more space in the living compartment as needed. There's a tilt-wheel for ease of access. I've been driving GM vehicles for so long that I'm a little disoriented learning the Ford controls, but I will get used to it, I reckon. Front End: A few days later we came back to Big O and had them fix the huge amount of camber that made the thing dance all over the road. It's still not great; the power steering seems almost too responsive. Lisa says we should look into getting an RV steering stabilizer installed to make it less jittery-feeling. Air Conditioning: Lisa tested the AC in Sacramento when she came to inspect it, but shortly after we took delivery and it started to get warm, we couldn't get any cold out of it. Taking it to a shop, they found that the seals were all shot and had to be replaced and the AC recharged. It appears that the dealership just pumped a can of coolant into the system long enough for it to blow cold air for Lisa and didn't worry about it all leaking out. On the bright side, the van has already been retrofitted with an R-134-compliant AC system. Electrical: The heavy cord that connects the RV to ground power was frayed and broken. We bought a new cable from Safari RV in Reno and Lisa wired it into place. She also gave me an adapter to allow the standard 30A RV plug to plug into an ordinary 20A 110V circuit, which is fine because the main breaker on the RV is only 20A anyway. I'll carry a regular extension cord for when I can get at ground power rather than wrestle with the difficult-to-stow 30A RV cord. Batteries: It's important that the 12V DC power hold on the RV overnight so I can use my CPAP machine. (I have the 12V connector for it.) The first time I plugged it in, it flashed and displayed a not-enough-power error. Upon investigation, we determined that both the chassis battery (that's what starts the engine and runs the van accessories like the AC, just like most vehicles) and the coach battery (which operates the "hotel power" to the RV lights, water pump, 12V DC plugs in the living compartment, and so forth) were shot. Yesterday we went to NAPA and bought two new batteries. Lisa was relieved to learn that Interstate is the OEM for NAPA's deep-cycle RV batteries. We put the coach battery on the charger to be sure it was fully charged, and I slept in the RV last night and found no degradation of power overnight. Battery Tie-Downs: It's dangerous to just set a vehicle battery in place without a tie-down bracket. We found that neither battery had been secured, and most of the bracket tie-down parts were missing. As all the brackets at the auto parts stores were cheap Chinese junk, we went to Lowe's and bought some threaded steel and a length of angle bracket. Lisa cut this down and shaped it with a hacksaw, grinder and the oxy-acetylene torch she has. (This was part of the large amount of gear, such as the welding tools, that we hauled down from Oregon when we moved here.) With that work done, we now have both batteries safely secured. I haven't totaled it all up, but the repairs on the van came to somewhere in the neighborhood of $2000, a significant portion of the total purchase price. 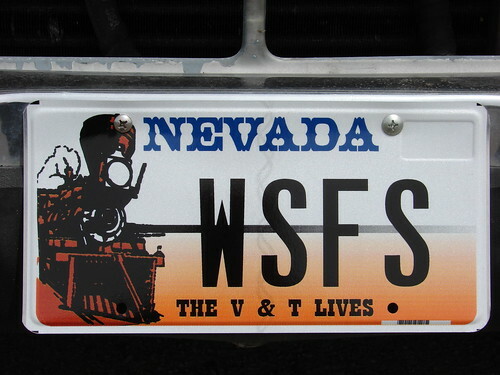 There was also of course the registration, including paying Nevada sales tax, but that was to be expected. I thought of getting SMOF4 to follow on from the sequence of the Astro. (SMOF is already taken. SMOF1 and SMOF2 would be presumptuous for fannish historical reasons.) But I decided to go ahead and get this one. I'm wondering if I should get transfer letters and put WWW. and .ORG before and after the plate on the rear of the RV. So here I am with the refurbished and licensed Rolling Stone ready to roll. I've already spent a couple of nights on board to check how well it works, preparatory to driving it to the Bay Area tomorrow. I've been spending $80-$120/night on hotel rooms (after tax) when I'm working at the office in the Bay Area. 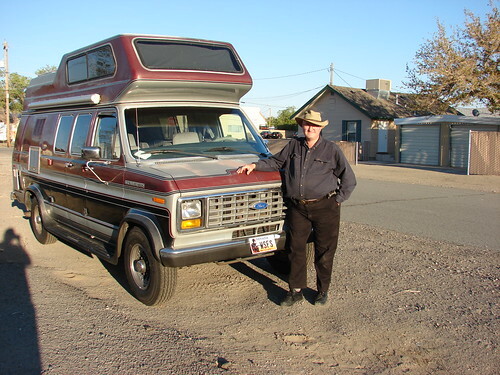 On that basis, even accounting for the additional fuel the RV burns, Lisa reckons that the money we invested on this thing including repairs should be paid off within about a year. I should be able to park at my office; I wouldn't even be the only person doing this. I'm likely to go spend the weekend at an RV park when I spend two-week stints in the Bay Area. This is a big investment, and it's going to take some getting used to, but it does seem to be the right thing to do with my home-and-away work schedule.